Ross is the leading supplier of Ribbon, Tumble and Vertical Blenders for dry powder blending and drying for the process industries. 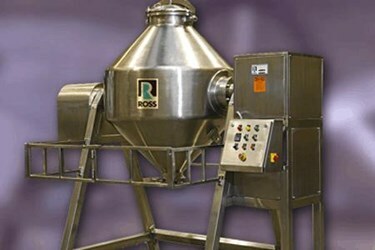 Many products including pharmaceuticals, foods, chemicals, fertilizers, plastics, pigments, and cosmetics are manufactured in Ross dry blending equipment. Sizes range in capacity from 1/2 cu ft. laboratory models to 1000 cu. ft. production units. A wide variety of horsepower and speed combinations and optional features such as sanitary finishes, vacuum construction, special valves and cover openings are offered. The world's largest dry blender inventory is available for shipment from stock. Ross Blenders are also available for purchase or trial rental and no-charge testing prior to purchase.